More over Fiddle Leaf Fig. There’s a new cool house plant in town and I’m obsessed. The rubber leaf plant is officially the It plant in modern design. It’s easy to see why. Let’s take a scroll, shall we? Rubber leaf plants have luscious, dark green, glossy leaves that add sultry depth and drama to a space. They’re still nice and architectural like the beloved fiddle fig, but I find the rubber leaf plant to be a bit more sophisticated. The plant can grow in a variety of ways. Tall and lanky. Thick and busy. You can keep them rather small – little enough to sit on a console – or let them go to dizzying heights. I’m particularly fond of the big, thick look. A quick search on the interwebs shows that the rubber leaf plant is relatively easy to take care of. 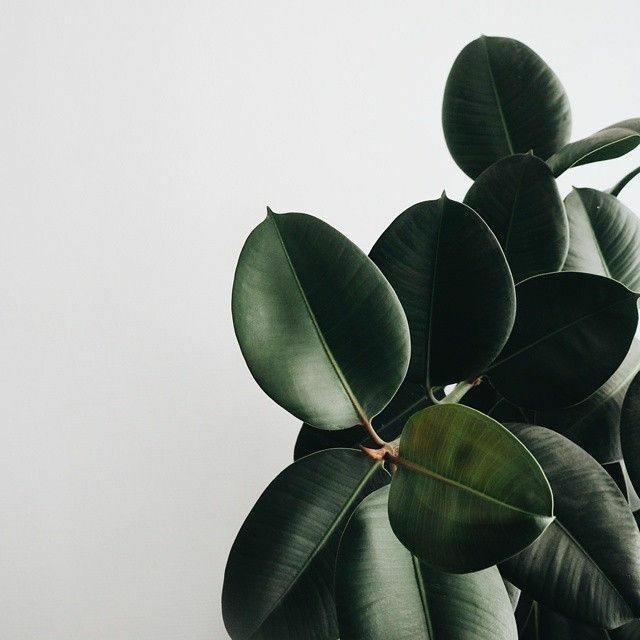 The ficus elastica (if we’re getting scientific), can really thrive in indoor environments. They love indirect bright light. No supper sunny spots though. You can tell if your rubber plant is unhappy if they start getting leggy or losing their lower leaves. The rubble leaf plant also needs well aerated soil. No sitting in water for these guys, so make sure your pot has good drainage. They react to the size pot in which they reside so if you’d like to cultivate a large rubber leaf, give their roots some room. The best way to transplant a rubber leaf is to transfer them into a pot about an inch bigger than its current home. Jumping to a really large pot will make them unhappy. If you live in balmy climates you can take your rubber leaf outside where they can grow as large as 100 feet! I would love to see that. When it comes to watering, the rubber leaf is pretty easy to keep alive. Simply keep it moist, including the leaves during the summer growing season. Leaves should be regularly wiped off or misted as well. In the winter you can get away with watering once or twice a month. Droopy leaves means your rubble leaf plant wants more water. Yellow or brown leaves means he’s gotten too wet. But when properly cared for, a rubber leaf plant offers a really chic pop of life in any space. I’d like a little one on my dining table. One in the corner of my living room and even one next to my tub. What say you? Are you ready to kick the fiddle leaf fig to the curb?? For more on all things house plant related, CLICK HERE. For more theft worthy ideas, CLICK HERE. Yes! I think the Fiddle Leaf Fig is beautiful but so tricky… finicky and hard to keep alive and if you touch it it makes your skin itch; maybe that’s just me… I’m super happy to see a new “It” plant on the horizon. But I think I need something that is easy to maintain and doesn’t need a lot of attention… The Rubber Tree looks pretty. Thanks for all the tlc upkeep and care tips. TGIF!